ARE MBAISE CATHOLICS OUT TO DISOBEY THE POPE? THE Roman Catholic Diocese of Ahiara was established a diocese in Ahiara in the region of Mbaise in Imo State out of the old Diocese of Owerri on November 18, 1987 with Bishop Victor Adibe Chikwe as its first bishop until his death on September 16, 2010. On Friday, December 7, 2012, Pope Benedict XVI announced the appointment of Monsignor Peter Okpalaeke, a native of Amesi in Aguata Local Government Area of Anambra State, as the second bishop of Ahiara to shepherd the Diocese. That announcement didn’t go down well with the Catholic Faithful of Ahiara Mbaise Diocese who unequivocally rejected the appointment of Father Peter Okpalaeke from Awka diocese as the Bishop of Ahiara Diocese to succeed late Bishop Victor Adibe Chikwe. Ever since then, Okpalaeke’s candidacy for the Episcopal Seat of the Diocese has not been welcomed by the people of Mbaise and all efforts to resolve the crises met with an unprecedented resistance by the people of Mbaise who are agitating for an indigenous bishop. According to reports, the protesting congregants sealed off the Cathedral premises to prevent the Episcopal ordination/installation of the Bishop-elect. A diabolical dimension was introduced to the opposition when the protesters ended their peaceful march around the town in black attires, depositing a coffin near the Cathedral premises signalling danger for whoever tries to impose himself on them. That Christians did this was unbelievable. As a result of this unrelenting resistance by the Mbaise people, the Episcopal ordination of the Bishop-elect billed for Tuesday, May 21, 2013 was relocated to the Seat of Wisdom Major Seminary Chapel, Owerri to forestall any form of violence. No less than 26 bishops attended. Among them were Bishops Solomon Amatu (Okigwe), Vincent Ezeonyia (Aba), Augustine Ukwuoma (Orlu), Hilary Okeke (Nnewi), Callistus Onaga (Enugu), Joseph Ekuwem (Uyo), Paulinus Ezeokafor (Awka), Camillus Umoh (Ikot Ekpene), Emmanuel Badejo (Oyo), Matthew Audu (Lafia), Hyacinth Egebo (Bomadi Vicariate), Gabriel Dunia (Auchi) Michael Elue (Iselle-Uku), etc. Nine (9) Archbishops including Archishop A.J.V Obinna (the Principal Consecrator), Archbishop Ignatius Kaigama (President CBCN), Archbishop Valerian Okeke (Onitsha) and Archbishop Brian Udaigwe (Papal Nuncio to Togo and Benin Republic) were also present. The Papal Nuncio, Archbishop Augustine Kasujja and Cardinal John Onaiyekan attended the ceremony. Preaching during the mass, the Bishop of Umuahia Diocese, Most Rev Lucius Ugorji welcomed all present for their solidarity, observing that they have gathered for a very important ceremony to the Roman Catholic Church. He confessed that Mbaise, the said Ireland of Africa is a good land blessed with enough human resources both in the clergy, government and education, noting that the Bishopric is a divine position and is only a gift reserved for the Church. Bishop Ugorji therefore appealed to the Mbaise people to bury the hatchet and accept Bishop Okpaleke, assuring that he is a good man with an outstanding history of integrity and honour, stressing that Bishop Okpaleke who then appeared to be the rejected stone may be their corner stone tomorrow. He noted that Okpalaeke’s appointment was not an imposition out of bad will but a manifestation of the universality of the Church. Okpalaeke was thereafter consecrated Bishop with some priests, religious and laity from Ahiara diocese pledging their allegiance to him pending when he would take over the canonical possession of the diocese. Nevertheless the Ahiara indigenes vehemently opposed the appointment, contending that their diocese regarded as the Ireland of Africa was grossly marginalized. They alleged that with the help of Francis Cardinal Arinze (a native of Eziowelle in Anambra State), in the Vatican City, Awka has produced five bishops while Mbaise has none; Onitsha Province has 15 bishops while Owerri Province has only four. They therefore queried the rationale of going to Awka to select a bishop for Ahiara diocese where there are more than 500 indigenous priests who are very qualified to be the bishop of Ahiara diocese? The Mbaise faithful are asking what happened to the list of various priests sent by late Bishop Chikwe as possible successors? One request the clergy and laity in Ahiara diocese have consistently made to the Papacy is to make open and transparent the process of appointing a local ordinary by giving them an opportunity to contribute and vet whom their next bishop should be, insisting that the Catholic Church is no longer in 17th Century where a bishop is imposed on the local people. Our investigation revealed that such ‘affront’ motivated the Apostolic administrator of the diocese, John Cardinal Onaiyekan to label the laity and clergy “clannish” which the Mbaise people saw as a calculated attempt to discredit the legitimate inquiry by the Ahiara Catholics. The numerous smear campaigns did not dissuade the clergy and laity, believing that the Catholic Bishops Conference of Nigeria is sharply divided along the decision reached by Francis Cardinal Arinze and some bishops whose primary duty is to confirm bishopric candidates from Nigeria to the Vatican. Some of the bishops are silently angry but are not able to voice their concerns to avoid being reprimanded. Some of them believe the laity and clergy of any diocese should be able to decide and nominate bishopric candidates whenever a vacancy exists, they also suggest that it doesn’t tell good about how the Catholic Church in Nigeria is run by a group of elite bishops and cardinals who pick their relatives and those they feel are loyal to them to be made bishops wherever vacancy exists without first considering the local clergy. Ahiara people are still relentless in their communion with the Holy Sea though they have been suppressed and denied the sacraments of holy orders and confirmation and so many other things for over four years. The people still show willingness to work with pope to resolve the issue but are not willing to take intimidation in the name of religion. This course of action was necessary, he continued, “Because the people of God are scandalized. Jesus reminds us that whoever causes scandal must suffer the consequences. Maybe someone has been manipulated without having full awareness of the wound inflicted upon the ecclesial communion.” Following the Pope’s address, Cardinal Onaiyekan, Archbishop of Abuja and Apostolic Administrator of Ahiara, thanked the Holy Father. Following his remarks, the Prefect of the Congregation for the Evangelization of Peoples, Cardinal Fernando Filoni, asked the Holy Father that the Diocese of Ahiara, with its Bishop, might make a pilgrimage to Rome to meet with him when the situation was resolved; a request the Pope accepted. Whether the priests and lay members will comply with the papal directive is yet to be seen as the president of Mbaise Priests Association, Rev. Father Austin Ekechukwu and other members of the group including the suspended chairman of the Laity Council, Chief Gerald Anyanwu and President, Catholic Women Organisation, CWO, Chief (Mrs.) Felicia Nwogu proved abortive. It was later learnt that they were consulting their people with a view to making their position known via a world Press Conference on July 1. The only strong voice who volunteered information from the community yesterday pleaded for anonymity, saying it would be difficult for a retraction now because the cravings of the Ahiara people were yet to be met by the ‘purported’ papal directive. “Hearing such a directive doesn’t make it authentic. I don’t know whether it’s true or part of the evil machinations of certain people bent on imposing foreigners on the law-abiding people of Ahiara. I don’t know if the Nuncio sent such a letter. There have been several communications from diverse sources and you do not know which one you’re going to take divine interest in receiving. “Personally, if the Pope decides to suspend or excommunicate me from the Catholic Church because I don’t want Okpalaeke as bishop of Ahiara, well I will go to my house and stay because there is salvation outside the Catholic Church. But I don’t think the Pope will tell the people of Ahiara Diocese to apologise to him…because if we offend the Pope or God, we go for confession. In the Catholic Church, we know how to atone for our sins. I don’t know why we should go so far,” the source said. He noted that in the Catholic Church the position of the Pope is sacrosanct but “we feel that since he is working with human elements there could be mistakes somewhere along the line,” he stated, adding that the church in Ahiara has been working without the bishop, “because over 90 per cent of Mbaise Catholics are not in support of the appointment of Okpalaeke. “I hear that the Pope has directed that Okpalaeke to make efforts to resume as bishop of Ahiara and the only duty the world has now to make it realistic, is to come and pound the Ahiara ground for him so that he can come in,” he said, introducing a new dimension when he said: “when we met Cardinal Arinze in Dallas, US, he told us he didn’t know anything about the appointment of Okpalaeke but when we returned to Nigeria we discovered that he and his cohorts were members who actually nominated Okpalaeke for Ahiara Diocese. That’s why some of us are confused.” He further argued that if Okpalaeke was incarnated in Ahiara Diocese, the people of Ahiara will accept him as their bishop. “If he is from America or anywhere else and was incarnated, he would be accepted,” he added, pointing out that the Pope knows how to follow the Canon when an appointed bishop is unable to take possession of his Seat, he is reappointed to another duty. 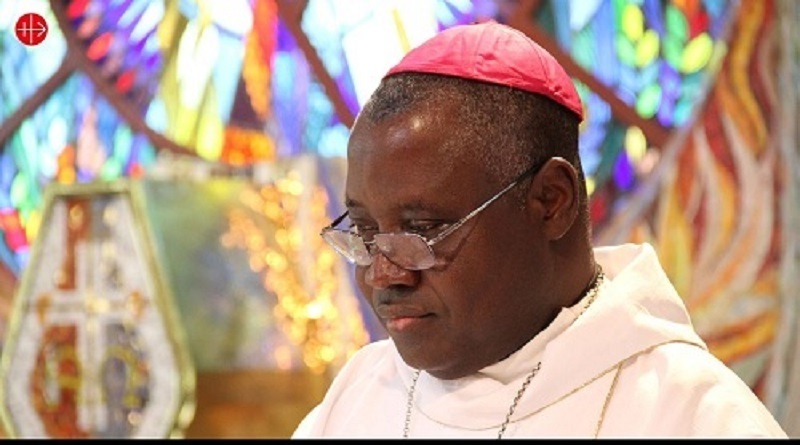 Narrating their experience at the Vatican City, the president of Catholic Bishops Conference of Nigeria, CBCN, Archbishop Ignatius Kaigama who lamented the protracted opposition, aligned with the position of Cardinal Okogie, arguing that the Ahiara Diocese owes it a duty to obey the papal instruction. His perspective: “Pope Benedict XVI appointed Peter Okpalaeke as bishop of Ahiara Diocese and Pope Francis confirmed him and he was ordained but he has not been installed as the bishop of Ahiara because of some resistance. “This has lingered on for close to five years now. The church has hope that there would be some understanding and the issues would be resolved peacefully and heartily so that pastoral work can resume but unfortunately that has not happened. 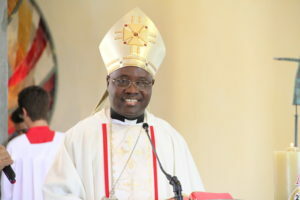 The diocese would not allow Bishop Okpalaeke to set up his ministry as a residential bishop and a lot of talks, writings, negative sentiments have been expressed by people in Ahiara and abroad,” he stated, noting that some of the outbursts are not characteristic of the Catholic Church. Continuing, Kaigama who is also the Archbishop of Jos lamented that some personalities in the church have called names while various allegations have been made and it’s in that regard that leaders have been praying and hoping that solution would come “but the more we tried to hope for a solution the more that problem tends to deepen and the insistence that Bishop Okpalaeke cannot be bishop in Ahiara. They are insisting that only a son of the soil can be bishop there which is what the Catholic Church cannot easily accept because it’s not done that way. “Now the Pope, having listened to all that has been said and done, invited a delegation of Ahiara people to Rome. He wanted five supporters of Bishop Peter Okpalaeke and five opponents to have a very personal meeting with the Pope. I had to go in my capacity as President of CBCN, and Cardinal Onaiyekan as Apostolic Administrator of Ahiara and the metropolitan Archbishop of Owerri, Most Rev. Obinna. We had a rigorous session of prayers, a retreat and a visit to holy sites and serious discussions with all those that matter at the Secretariat and the Prefect for the Congregation for Evangelisation of people and many other top dignitaries of the Catholic Church. “After all our prayers, the Pope had a meeting with us where he gave his word for us. His word was spoken spontaneously and everybody has heard the word. The words were written down and communicated to the whole world; for the attention of the people of Ahiara especially the priests. It affects then a lot because the Pope insists and demanded that they should apologise for causing all the problems to the lay people and the faithful in Ahiara Diocese; and for disobeying his orders. They should write a letter to apologise for that. “Those who do so before July 9, 2017 will definitely be warmly embraced by the Holy Father, but those who choose not to, will definitely incur what we call, a suspension a divinis. That means they cannot function as Catholic priests: they cannot administer the sacrament, they cannot occupy the ecclesiastical office. That is the directive of the Holy Father and we have nothing other than to wait and see that the priests of Ahiara Diocese will heed the call of the Holy Father, write to him and make up things and resume duties as Catholic priests in respect and obedience to the promise made by every priest. This therefore is a test to that obedience,” he maintained. Asked if the 10 persons were represented at the meeting with the Holy Father, Archbishop Kaigama said: “The five who have no objection to the appointment of Peter Okpalaeke as bishop of Ahiara made up of a Rev Sister, a traditional ruler and three priests represented the group that support the appointment of the bishop were in Rome. The other group opposed to the appointment did not go and there was no reason given by them for not showing up. §1 The Supreme Pontiff freely appoints Bishops or confirms those lawfully elected. 2 At least every three years, the Bishops of an ecclesiastical province or, if circumstances suggest it, of an Episcopal Conference, are to draw up, by common accord and in secret, a list of priests, even of members of institutes of consecrated life, who are suitable for the episcopate; they are to send this list to the Apostolic See. This is without prejudice to the right of every Bishop individually to make known to the Apostolic See the names of priests whom he thinks are worthy and suitable for the episcopal office. 3 Unless it has been lawfully prescribed otherwise, for the appointment of a diocesan Bishop or a coadjutor Bishop, a ternus, as it is called, is to be proposed to the Apostolic See. In the preparation of this list, it is the responsibility of the papal Legate to seek individually the suggestions of the Metropolitan and of the Suffragans of the province to which the diocese in question belongs or with which it is joined in some grouping, as well as the suggestions of the president of the Episcopal Conference. The papal Legate is, moreover, to hear the views of some members of the college of consultors and of the cathedral chapter. If he judges it expedient, he is also to seek individually, and in secret, the opinions of other clerics, both secular and religious, and of lay persons of outstanding wisdom. He is then to send these suggestions, together with his own opinion, to the Apostolic See. 4 Unless it has been lawfully provided otherwise, the diocesan Bishop who judges that his diocese requires an auxiliary Bishop, is to propose to the Apostolic See a list of the names of at least three priests suitable for this office . 5 For the future, no rights or privileges of election, appointment, presentation or designation of Bishops are conceded to civil authorities. Thank God for he never forsakes his church. Thank you lord for the wisdom you gave to the pope.